Posted by DustinRJay in carrying costs. One macroeconomic factor affecting real estate is interest rates. As interest rates go down, house prices should go up and vice versa. How have you calculated carrying costs? Interest, taxes, maintenance, depreciation? Hey there mohican. I enjoyed reading your Vancouver real estate uberpost the other day! I was curious what is your work background? The carrying costs just included the interest that would be paid to the bank (5 year conventional mortgage rates times house price). That is what I thought. I did a similar chart – included in the “Uberpost” which compared mortgage payments to rents. I will use your chart as inspiration for a new one based on long term home prices. I have worked for the past 3 years as a Financial Planner at a major brokerage firm and the previous 7 years I was in the telecommunications field. I did simlar analysis for the Vancouver Benchmark – adjusted for inflation – and I found the median carrying cost from 1975 to 2007 to be $33,200 / year. It ranges from a low of $25,550 in 2003 to a high of $104,300 in 1981. It is currently $46,260. Did you use median prices or the benchmarks available here? 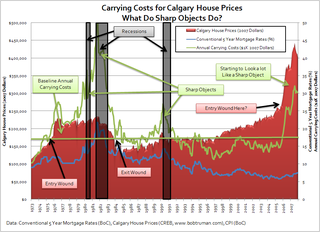 Thanks for the link to the Royal LePage Calgary housing price index. 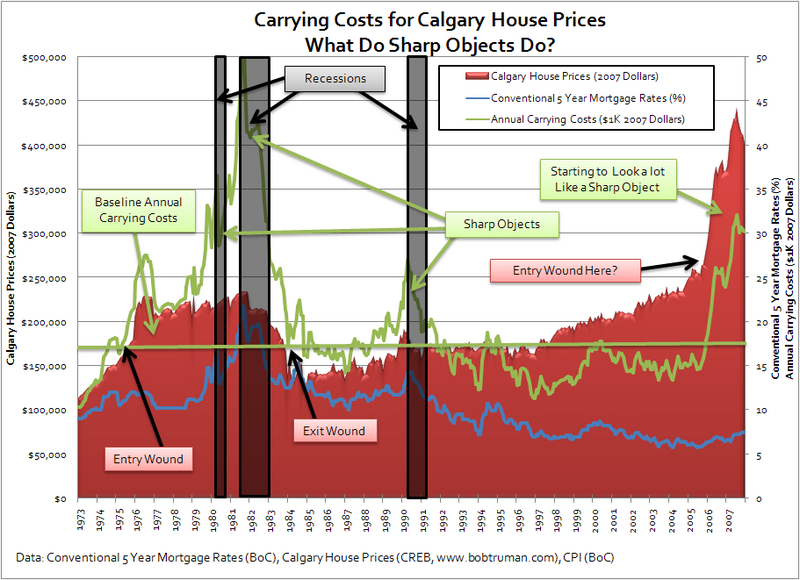 I used the ‘old criteria’ average price that the Calgary Real Estate Board had tracked from 1973 to 2007. I had been looking for a hedonic regression set for awhile. Unfortunately, the 2006-2007 data is missing from the R.L. housing price index… GRRRRR. Love the graph! Being in Vancouver, I’m delighted to hear Mohican has been inspired by it. Hi radley77!… thanks for the analysis! It’s very interesting. 1976 to 1983 was really a painful period in Calgary considering the high carrying costs were for houses averaging about 225k in value!